Today marks Rare Disease Day, an international celebration of rare disease and the patients who live with them every single day. Kyle and I are joining other INAD families in an effort to raise awareness by using the phrase #beatINAD across all social media platforms today. As we continue to raise awareness for children with INAD, I got to thinking about my column series this year on lessons from children's books. Last month, I wrote about our love for Pete the Cat, which was an easy place to start. When Kyle asked me about my second month's pick, I had a little more trouble, with so many great books to pick from. I settled on two books by Drew Daywalt, including "The Day the Crayons Quit," and "The Day the Crayons Came Home." If you haven't read either of these two titles with your children, I highly recommend it. We have really enjoyed them. Grace received "The Day the Crayons Quit" for her birthday one year from Kyle's Aunt Kathy. At the time, we thought it was the perfect book because Grace hated to color, no matter how hard I tried with her. We figured she probably did wish that her crayons would quit! As the story begins, Duncan opens his desk to get out his crayons, only instead to find a stack of letters written by the crayons with their grievances to him. Red crayon was mad that he had to work on holidays like Christmas and Valentine's Day. Purple crayon was mad that Duncan colored outside the lines, and yellow and orange crayons were in a fight about which was the true color of the sun. Pink crayon pleaded with Duncan to use him, even though it was a girls's color, and blue and gray crayons both felt they were overused coloring things like oceans and rhinos. In the end, Duncan decides that he wants all his crayons to be happy, so he uses his creativity and changes the colors that he uses for different things, making a beautiful picture. In his final picture, the whale is orange, the sky is yellow and the ocean is green. It got me thinking about how we all have different talents, and want to be used in our own ways. Maybe we don't always fit the mold of how things are usually done, but we all have something to offer with just a touch of creativity. Then, at Christmastime, Kyle and I were delighted to find a follow-up book, and put it under the tree for Grace. "The Day the Crayons Came Home" is just as cute, with fun new crayons, like pea green, who changes his name to Esteban the Magnifient because no one likes peas. At the start of this book, Duncan gets a stack of postcards in the mail from some of his crayons that have been discarded or lost over the years. There's neon red crayon who was used to color a sunburn, and that got left by the pool on vacation. Then there was a light brown crayon, possibly tan or burnt sienna, that had been eaten and puked up by the dog, and now covered in fur. Duncan managed to leave his glow in the dark crayon in the basement after they used it to draw scary pictures for his baby brother. And gold crayon got blunt when Duncan individually colored a pirate's treasure coins. As a treat, orange and yellow crayon came back, but they were no longer arguing about who was the true color of the sun because they had been left outside, and melted together. In the end, Duncan was sad to learn about all the crayons he'd lost and forgotten, so he ran around gathering them up. However, by now, they were all so badly damaged and misshapen that they no longer fit in his crayon box. Instead of throwing them away, Duncan built a brand new crayon box where all of the crayons would feel at home, no matter what shape they were. And that's what got me thinking about Rare Disease Day. We've met so many kids who have different abilities and don't always fit into the normal pictures we paint. But with a little love and compassion, everyone can be included and given an opportunity to shine in his or her own way. This year on Rare Disease Day, I hope you will take a few moments and help us to raise awareness about INAD, and what a devastating disease it is. But I hope you will also take a few moments and think about ways you can be more empathic and compassionate to those around you, and help them find their own ways to shine in the rainbow of life. Although I am a Hillsboro Hiltopper and Kyle is a Lincolnwood Lancer, we have been embraced by teams all over Montgomery County. In addition to the Hiltoppers and the Lancers, Grace now sports team gear from the Litchfield Purple Panthers, Nokomis Redskins and Morrisonville Mohawks. We affectionately refer to all the love and support from high school teams all over as part of Team Grace. 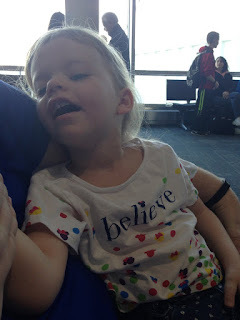 It's a good thing we have this blog, because I can't even remember the number of sporting events we have attended this past year in honor of Grace. We feel SO blessed by the number of teams that consider Grace an honorary member, and she definitely loves all the attention. We hope you enjoy a recap of a few fun nights from the last few weeks. At the preview night for the boys basketball season this year, the team started collecting money for Grace and for INAD research. Kyle brought Grace that night, where she caught up with some of her favorite cheerleaders, cousins Kayley and Kensey Armour. The team continued to collect money throughout the season with a special fundraiser between the junior varsity and varsity games. Coach Matt Millburg asked us to come to the last home game of the season and be part of the senior night festivities. Unfortunately, we had already promised the crew at Nokomis High School, we would take Grace to a game there that night, but Kyle stood in as a representative for all of us. Coach Millburg presented Kyle with $1,000 for INAD research. He was planning to go and take photos at senior night, so he just posed for one himself before he left. They very generously gave us $1,000, which we put up for INAD research. Just a week later, Will Gunn called Kyle for another donation. The school's community service organization had received just over $500 from the Central Illinois Blood Center, for their hard work in hosting local blood drives. They got to pick any charity to donate to, and they picked Grace and INAD research. It was definitely a great night to be a Lancer. It was also a wonderful night to be a Redskin! Several weeks before, the Nokomis Athletic Club asked if we would bring Grace to a game when the Redskins hosted the Hillsboro Hiltoppers. But we were at Walt Disney World that weekend, so it didn't work out. 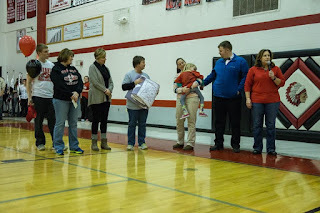 We were SO honored that the Nokomis Athletic Club honored us at a basketball game. Instead, they picked one of the final home games of the season, and Kyle met Grace and I in Nokomis after he finished up his duties in Raymond. We spent some time in the lobby visiting with Nokomis Athletic Club members Julie Knodle and Missy Keiser, who had a bright red Arrowhead Open shirt for Grace to wear! Grace got a beautiful new purple and white quilt, made by Marian Kimbro. We made our way to the gym, where we found a seat in the front row so Grace could watch the basketball game. At halftime, Julie invited us down to the floor for a special presentation. We knew they had a donation for the INAD study, but they totally spoiled us the night we were there. 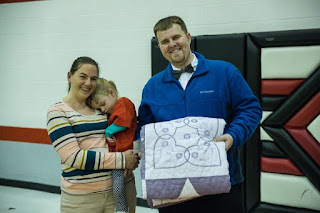 In addition to giving more than $600 for INAD research, they presented us with a purple and white quilt, made by the boys basketball coach's mom, Marian Kimbro. She donated the quilt to the group with the stipulation that it had to be used for something special, and they were honored to give it to Grace. 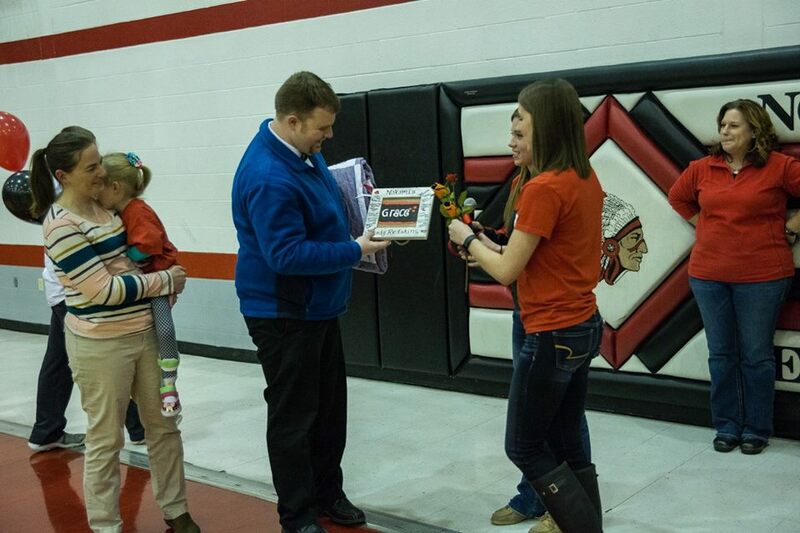 The girls basketball team had some presents for Grace, including basketball roses. Then, members of the girls basketball team gave Grace some basketball roses, which are sitting in a vase on her dresser, and a picture frame with her name in the middle. All the players on the girls team signed the frame, and we hung it up in her room as well. The boys basketball team presented Grace with a red Redskins visor and some red and black balloons, which have always been one of her favorites. Kyle had the chance to tell our story. Kyle talked a little bit about how honored we were to be part of the family, and thanked everyone for their generous donations. We sat down to watch the end of the game, and Julie shared her popcorn with Grace, which was also a huge hit. After the game was over, a fan from the opposing team handed Kyle a donation for the study, and said they would keep us in their thoughts and prayers. Snuggles with my sweet Grace. We are always thrilled for a chance to share Grace's story with our community and make new friends along the way. This week, we headed back to where it all started, the Lincolnwood Junior High School volleyball team. Last year, Kayley and Kensey were eighth grade members of the team, and they were one of the first to join Team Grace last year. Many of the team members wore purple ribbons in their hair for Grace. 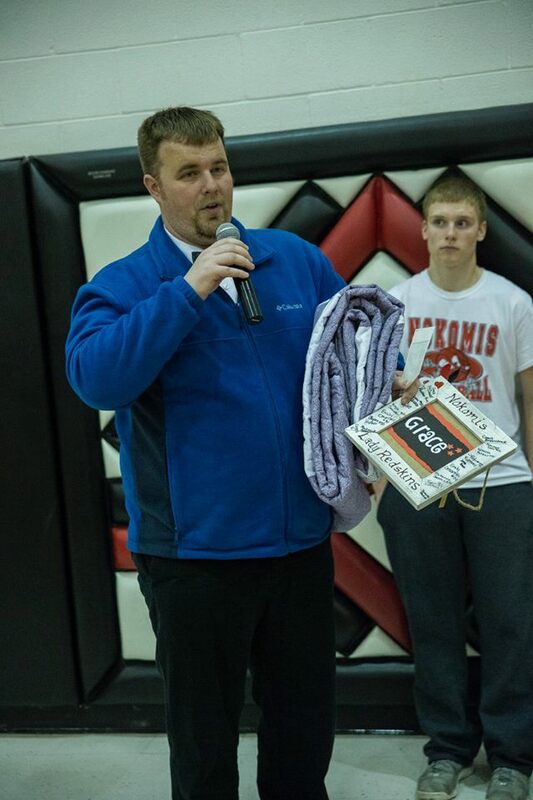 At the start of every game, they had a table set up to hand out gracelets, and also take donations for research. For the past two years, they have offered a Serving for Grace fundraiser, where a donation gets you a chance to enter your name into the contest. Between the seventh and eighth grade games, they draw a few names, and the lucky winners get the chance to serve a volleyball onto targets on the other side. Those who are successful win great prizes donated by local businesses. Kyle enjoyed his chances to Serve for Grace. Coach Kimberly Denny invited us to the last home game of the season this year, and we arrived just in time for the end of the seventh grade game, so we found a spot on the bleachers with Grandma Kim. And before long, they started the final Serving for Grace fundraiser of the season. Although some of the participants got close, no one managed to hit the target this night. But as an added bonus, the last person called up to serve for the evening was Kyle, who took it in stride, even if his serves didn't make it close to the targets. The eighth grade team members brought presents to Grace. We looked out into the crowd, where so many of the fans were wearing purple in honor of Grace. It's just so amazing to see such love and support from a dedicated community. 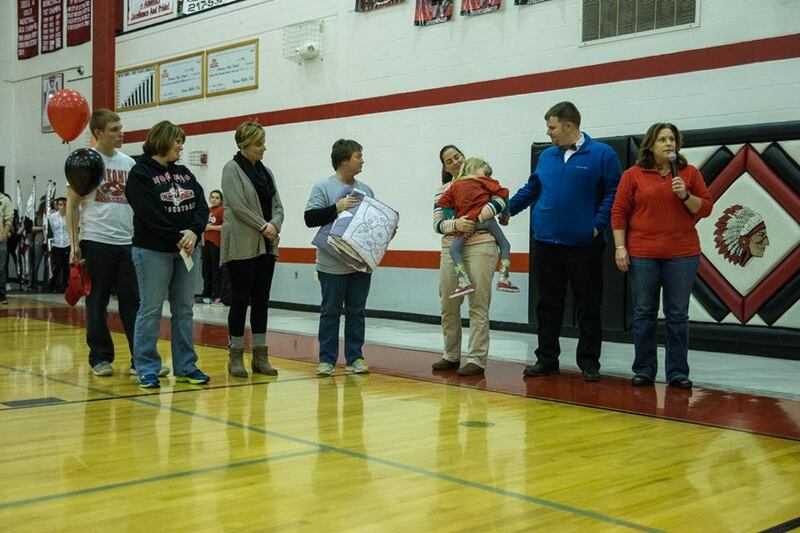 Just before the eighth grade team members were honored, they had a special presentation for Grace. 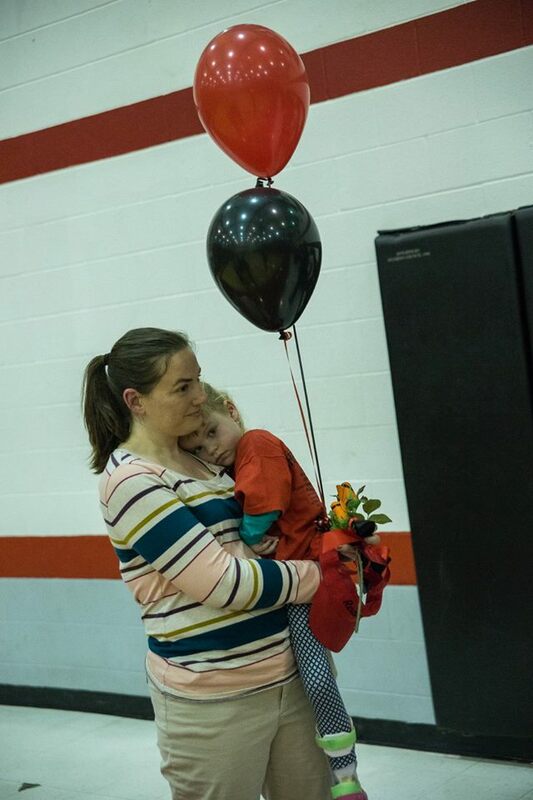 We took her in her stroller to the middle of the gym, where the four eighth graders gave her pink and purple flowers, orange and purple balloons, a gift card to Dairy Queen and $650 for INAD research. 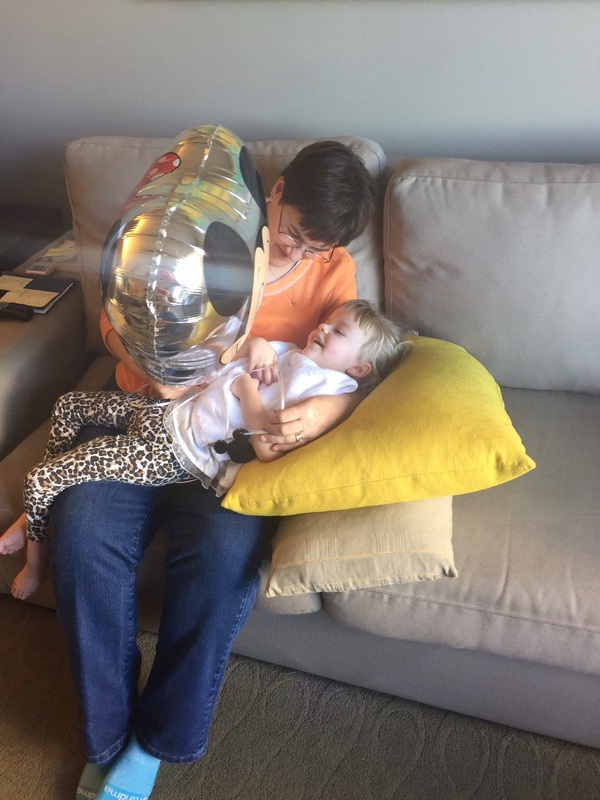 Of course, the biggest hit for Grace was the balloons, and we were thrilled to be able to donate even more to the research. So blessed to be part of the Lincolnwood family. I got the chance to thank everyone for their generosity, and Kyle helped Grace play with her balloons and flashing smiles to the crowd. We made our way back to our seats to watch the eighth grade team lose a close one in three games. After the game was over, we headed over to thank Coach Denny, who made Kyle promise not to use Grace's Dairy Queen card himself. Grace was also greeted by several young fans, including Jaylee and Paislei Krager, who always make time to stop and see her every time they can. Coach Denny got the chance to talk to Grace before the game too. This is the third time Coach Denny and her teams have recognized Grace, and we are blessed beyond measure to be part of the Lancer family. Up next for Team Grace will be the County Baseball Tournament on Saturday, April 16 in Litchfield. All four high schools will be represented there, and it will be the culmination of the temporary license plate fundraiser. The specialty license plates, featuring "A Grace-Filled Journey" logo, arrived this week, and we can't wait to put BEAT INAD on our two vehicles. It's been fun to see people post photos on Facebook of their vehicles with a new Grace plate, and the plates may be used through April. Check out the new Grace shirts with all the school logos! As part of the festivities, the Litchfield Student Council is selling new "A Grace-Filled Journey" shirts, with all four county high school mascots on the back. 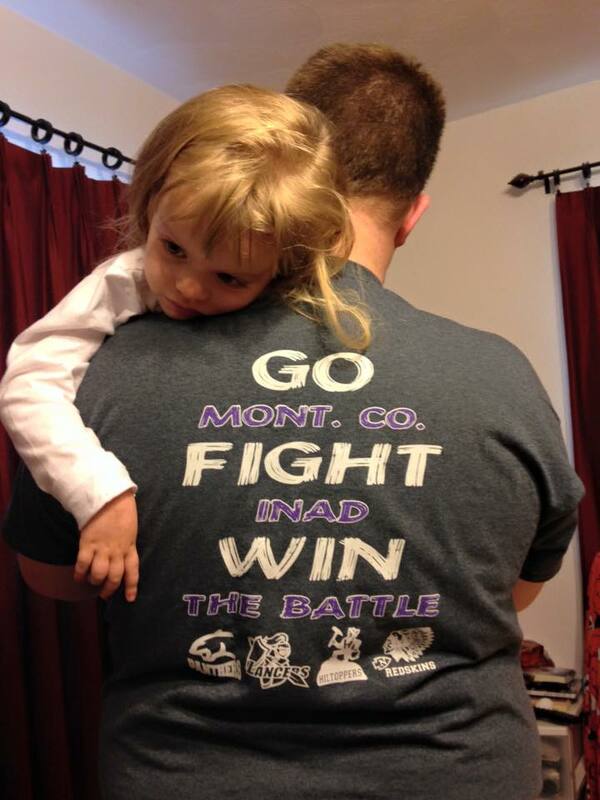 They read "Go Mont. Co Beat INAD Win the Battle." Mine has already arrived, and Kyle's and Grace's should be in soon too. We even heard that Tessa Steffens and her softball teammates at Purdue Calumet will be wearing the new shirts to warm up this season. How cool is that?! When we started this "Grace-Filled Journey," we hoped to raise around $10,000 for INAD research and share our story to raise awareness. More than $100,000 later, we hope to take our story and our platform to a national level this year. With community support like this, Team Grace is gonna take on the world. Thanks for being part of our "Grace-Filled Journey." The Herschelman family had a new sweetheart this year, thanks to the generosity of our Hillsboro United Methodist Church family. It was a week of love and celebration, and we were so grateful to be a part of it. Everything started the day we returned from our trip to Walt Disney World in Florida We returned on a Monday afternoon, which was a postal holiday, so it also meant it was a paper night. While we sat at our desks working on the next edition, a couple from our church showed up with snacks for the whole office. There was a tray of cheese, meat and crackers and a tray off sweet treats, like cookies, brownies and Rice Krispy treats. It came with a special card just to say that our church family loved us and was praying for us. I think our newspaper family was just as excited as we were for the treats. We didn't think a whole lot else about it, until the following night, when our pastor's husband brought dinner to the house. It was a delicious feast of salad, breadsticks and pasta, and there was plenty to last for several meals. Even Gracie Lou loved the pasta! 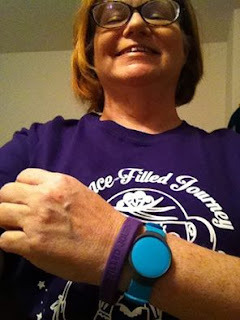 Pastor Joy wore her Grace shirt and asked everyone to pray for Grace on Saturday. On Wednesday, I saw a photo on Facebook of our pastor wearing her Grace shirt, and asked others to join her in prayer on Saturday for Grace and our family. We were also treated to another night of treats with our newspaper family on paper night. This time, it was a basket of fruit and another of candy. And I think we enjoyed every bite, as well as a chance to share with our coworkers. Grace with her teachers when her special balloons arrived. Thursday was Grace's day to shine, as all three of her preschool teachers wore their Grace shirts, and some of her classmates did as well. Grace got her very own balloon bouquet delivered to school, and her teacher sent me a video of her just giggling and giggling. Even as a baby, balloons have always been one of her very favorite things, and we got to enjoy them at home too! Grace loved playing with her balloons with her friends at school. While Grace was napping on Friday, I got a text from one of our church members, who asked if we were home. She delivered a big popcorn shaped tub, full of candy, microwave popcorn and soda, as well as gift card to the video rental store in town. It was everything we needed for the perfect movie night. And I have to say, we've enjoyed it all. Saturday was a day of prayer for Grace, and we are SO blessed to have so many people all over the world praying for Grace and all the children who are battling INAD. Which brings us to Sunday. As we walked into the sanctuary for worship, we saw many of the church members wearing various Grace shirts from different fundraisers. My cousin Phil's daughter, Izzy, was wearing her purple Grace shirt from the race, and her mom had made her baby brother, Henry, his own Team Grace onesie. It was so cute. And one of my favorite parts of the service was listening to Izzy, who is three, say the Lord's Prayer. The special service included some very special songs, like Amazing Grace and Sweet Sweet Spirit, which was my Grandpa Hutson's favorite song, and I chose it for both our wedding and Grace's baptism. During the service, the pastor talked about how the church family had decided to adopt us as sweethearts in honor of Valentine's Day this year. She talked about what an inspiration we have been on a very hard journey, and said they wanted to show us how much we were loved and cared for. They even presented us with a tree full of gift cards for gas and local restaurants to some of our very favorite places. Although Kyle and I don't' necessarily like to be the center of attention, we were truly touched by the outpouring of love and support, not just that week, but all year round. We are so grateful for all the people who lift us up in prayer. It gives us such strength and such hope for Grace. From the very bottom of our hearts, we love each and every one of you on this "Grace-Filled Journey." Every so often on our Grace-Filled Journey, we have the chance to meet a celebrity. This time around, we got to meet one of Grace's favorite celebrities, Fredbird himself. Grace LOVED getting to meet the St. Louis Cardinals mascot, Fredbird. Thanks to a generous invitation from Raymond Grade School Principal Aaron Hopper, Kyle, Grace and I stopped at the school on our way home from physical therapy in Springfield last Friday. Former Major League Baseball player Al Hrabosky and the St. Louis Cardinals' mascot, Fredbird, would be at the school for a presentation called "Doin' It Right," about making good decisions like staying in school and not doing drugs. We were honored they thought to invite Grace, and glad to be part of the festivities. To help her see a little better, we brought Grace in sitting in her Stingray medical stroller. Sometimes, it helps her to sit up a little better than if she's sitting on one of our laps. Grace and I snuggling during the presentation. As Kyle and I were driving home from Springfield, he said to me, "you know, there's a chance the kids are going to be just as excited to see Grace as to meet Fredbird." And he was spot on. Earlier this year, the elementary school students were part of a penny wars fundraiser for INAD research, so the kids already knew Grace and her story. We found a seat close to the edge of the gym, and watched as the students filed in the gym. When Principal Hopper told them about Grace as their special guest, the gym just burst into cheers. It was truly humbling to see how many lives that Grace continues to touch, and we are so grateful to be part of such an amazing community. Grace really enjoyed the program with Fredbird. It was soon time to start the program, and Hrabosky, who is one of the Cardinals' on-air broadcasters does a really great job getting the kids excited and involved in the program. 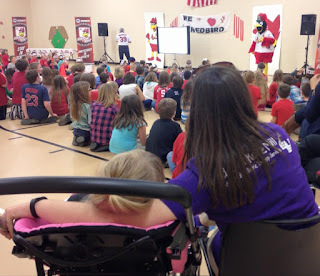 Fredbird adds his own special touches and humor to the show, which really makes a big impact on the kids. Grace definitely enjoyed all the music and just watching the kids. One special student came over to us after the program and asked if he could meet Grace. His name was Jensen Masten, and for his birthday this year, instead of asking for presents for himself, he asked his friends to bring donations to the INAD study for Grace. It was his goal to raise $200, and he ended up with $344, which we sent directly to Washington University. I can't remember a single one of my birthdays when I ever did something so selfless, and Jensen is still in elementary school! He and his family are such an inspiration to us. Grace really enjoyed getting to meet Jensen Masten at the assembly. After all the students filed out of the gym, we had a chance to meet Fredbird and Al Hrabosky. Fredbird came over and really paid a lot of attention to Grace. He put his beak on her head and also played peek-a-boo with her. She was a little on the tired side since she had physical therapy that morning, but she still had enough smiles. Kyle even shared our story with Mr. Hrabosky, who invited us to the media room the next time we visit Busch Stadium to see the Cardinals play. We had a chance to give him a gracelet, and can't wait to take Grace to visit him again this summer. It was a lot of fun to meet Al Hrabosky too. In addition to raising funding for INAD research, it's one of our goals to raise awareness for INAD all over the country. This presentation was a perfect chance to help raise more awareness, and a really fun opportunity for Grace to enjoy as well. Family photo op with Fredbird. As lifelong Cardinals fans, we can't wait to "take Grace out to the ballgame" this summer and spend some time with our new friends. All too soon, we woke up for our last day at Walt Disney World. 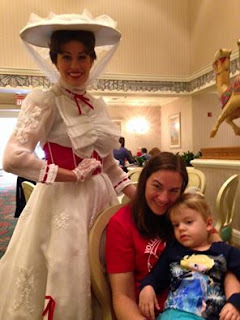 It was another early day with a character breakfast scheduled at 1900 Park Fare with Mary Poppins. She's always been one of my favorite characters, so I was really excited. The food was great, and it was fun to visit with Mary Poppins, Alice in Wonderland, the Mad Hatter, Winnie the Pooh and Tigger. I would have to say that Grace didn't necessarily enjoy the characters as much this time as she did on our last trip, but they always took time to talk to her and pose for photos. Just hanging out with Mary Poppins. 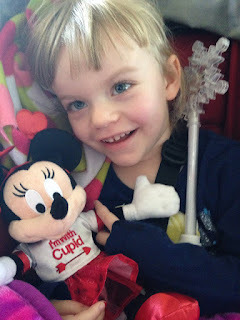 Before we left, we did a little shopping at the Grand Floridian's gift shop, and Grandma Susie bought Grace a Valentine's Day Minnie Mouse to snuggle, which she did for the rest of the day. Grace snuggling her new Minnie. After shopping, we split up. 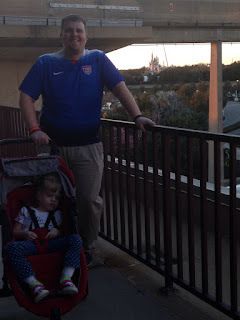 Kyle and I took Grace to Epcot Center for the morning, and the rest of the crew went back to the hotel for a nap. 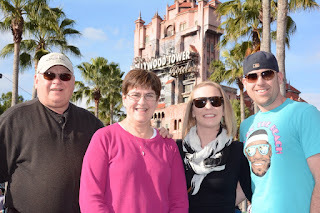 They ended up at Hollywood Studios later for a ride on the Tower of Terror and Star Tours, and of course lots of photos! Grandma and Grandpa hanging out with Johnny and Emily at Hollywood Studios. Time to ride the Tower of Terror! 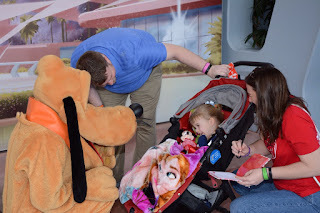 Our first stop at Epcot Center was a meet and greet with Pluto. He was one of Grace's very favorites the last time we came, and she actually had lots of smiles for him. Then, we took a ride on Finding Nemo and Journey Into Your Imagination with Figment. Johnny and I have always loved Figment, so that was fun, and I think Grace enjoyed the music during the ride. We also booked a fast pass to meet Mickey Mouse, Goofy and Minnie Mouse. Grace was starting to get pretty tired by the time we got there, but it was still fun to watch them interact with her. Time to meet Mickey Mouse! Then it was our turn to go back to the hotel for a nap. We stopped for some lunch at the hotel cafe, and Grace fell asleep across my lap while she was eating her lunch. Kyle took a nap too, while Gracie and I snuggled. And then we were headed back to Epcot Center for dinner. Grace just LOVED her new balloon! This time, Kyle and I decided it would be fun to take Grace on the ferry boat, and she loved it. 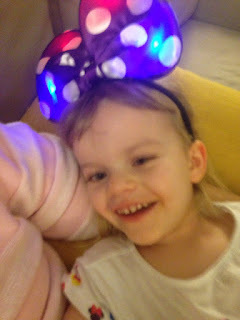 She smiled and giggled the whole ride to the Ticket and Transportation Center, and we loved watching her. 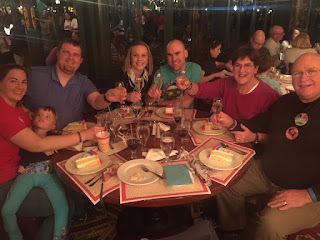 We were hoping to meet a few characters, like Donald and Daisy, on our walk to dinner in the World Showcase, but the lines were pretty long, so we made our way to Chefs de France for our final meal together. A celebration at Chefs de France on our final night together. It was a beautiful restaurant, and we got a table right by the windows. It was fun to be together for one final meal, as we shared the highlights of our trip. Mom and dad stayed with Johnny and Emily to see the evening's fireworks show, and Kyle, Grace and I took the monorail back to the hotel to get ready for bed. But before we parted ways, we stopped for a photo with our gracelets in front of the iconic Epcot Center ball, which was aptly glowing purple for the photo. The trip was truly a magical part of our "Grace-Filled Journey." 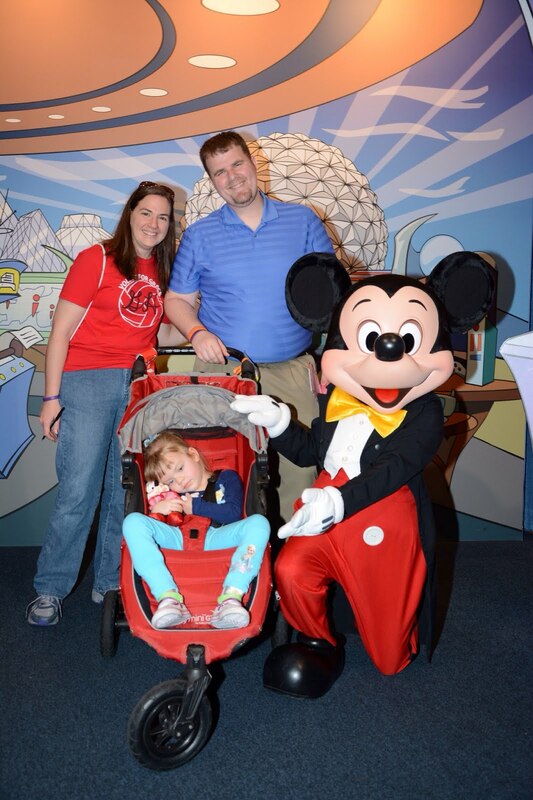 I struggled that last day because I wasn't sure if it would be the last time I would ever have the chance to take Grace to Walt Disney World. Both Kyle and my dad assure me that's not the case. But I found myself having a hard time leaving this time around. 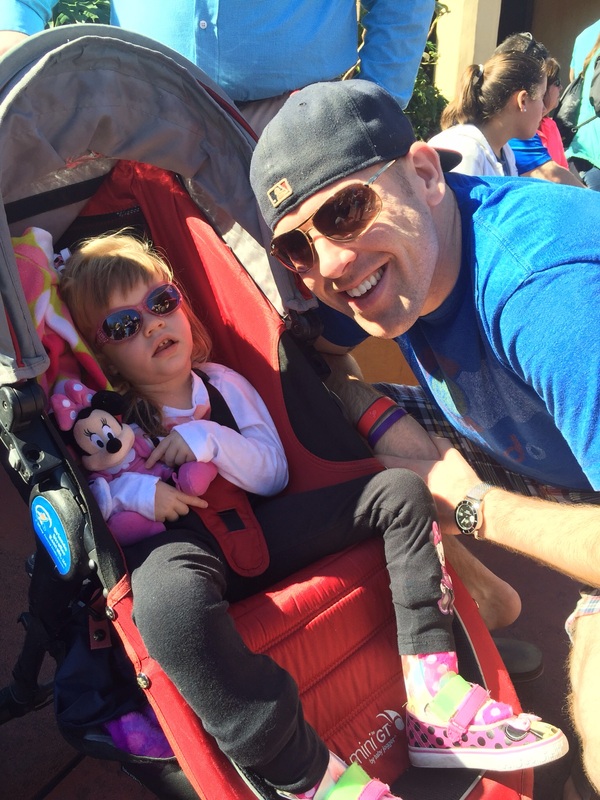 Even though Grace may not enjoy the wonder and magic of Walt Disney World the way some kids do, she definitely enjoyed being with us at the Happiest Place on Earth. And don't worry, I'm sure we'll be back. Our next adventure began today, but not as bright and early. With a late night last night, we opted to sleep in a little more this morning. After enjoying some breakfast in the room, we headed out to the Magic Kingdom. It's so nice to be able to walk from our hotel to the Magic Kingdom each morning. 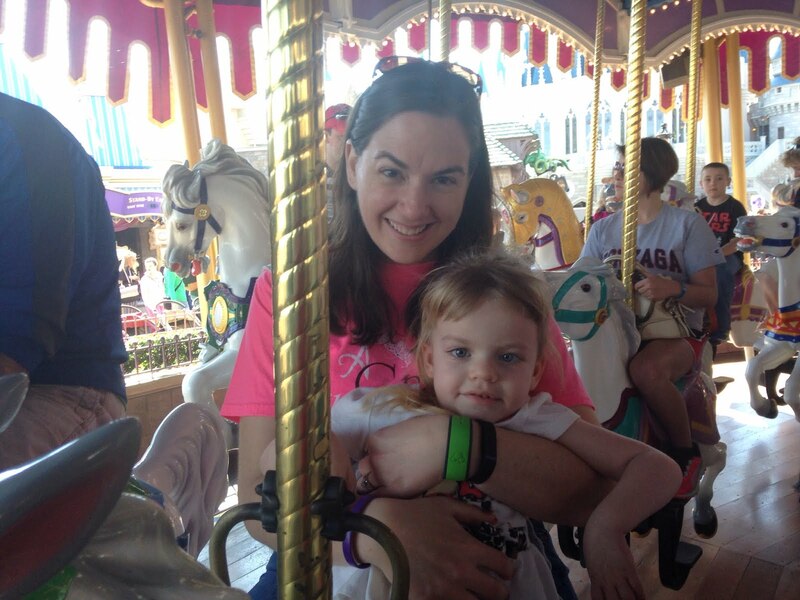 Grace and I LOVED riding the carousel! Grace had a Fast Pass right away to meet Cinderella and Rapunzel at Fairytale Castle, and it was a lot of fun. The Photo Pass has been really great to have because Kyle and I can both be in the photos with Grace. Grace even wore her new Cinderella bow she got for Christmas, just to show Cinderella, who admired it, and said she would have to get a bow that looked just like Grace. After meeting the princesses, we had a few minutes before our next Fast Pass, so we took Grace for a ride on the carousel. She sat in front of me on one of the horses, and we both really enjoyed it. Kyle stood next to us and took pictures. Grace got to be an enchanted pepper shaker at Belle's Enchanted Tales. Grandma and Grandpa Galer joined us again as Uncle Johnny and Aunt Emily headed off for Epcot Center. One of the things I thought Grace would really like this trip was Enchanted Tales with Belle, which is an interactive story with Princess Belle. And she did. Grace got a part as a pepper shaker in the story, and I helped her carry it out, as daddy, grandma and grandpa cheered for us. She even got her picture taken with Belle at the end. Grace even got to meet Belle after the Enchanted Tales! Another thing I thought Grace would really like this time around was Mickey's Philharmagic, which is a 3D experience with lots of music. We couldn't talk Grace into leaving her 3D glasses on, but every time I looked over, she was waving her arms and smiling. I think it was something she just loved. Getting to meet Tinker Bell at the Magic Kingdom. Before we sent her back to the hotel with grandma, we made a quick stop to meet Tinker Bell at the Town Hall. 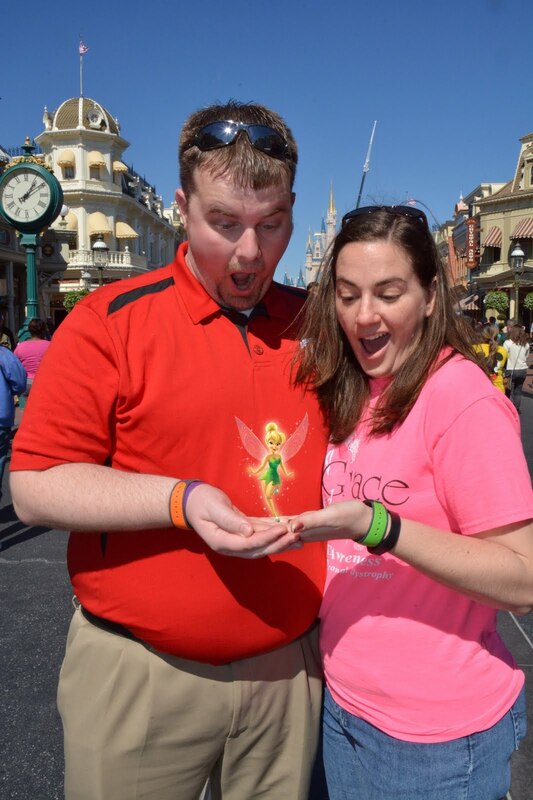 Grace showed her the pixie dust she wore in on her shirt, and Tinker Bell was so cute. With a brand new Minnie Mouse balloon from grandma and grandpa, they headed back to the hotel room, and Kyle and I headed to Hollywood Studios. 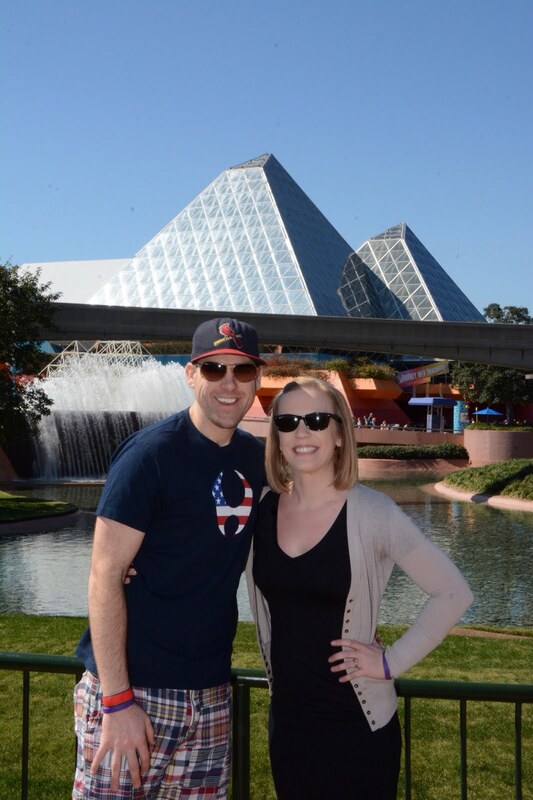 Uncle Johnny and Aunt Emily at Epcot Center. 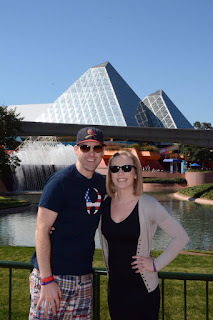 While at Epcot, Johnny and Emily rode Figment, which has always been one of our favorite rides and Mission: Space. Grandpa John met up with them later for some music in the World Showcase. Grandma Susie and Gracie played in the hotel room with her new balloon and took a nap after lunch. Grace LOVED playing with her Mickey and Minnie balloon from grandma and grandpa. Kyle and I grabbed a bite to eat at Hollywood Studios, and split a brownie for dessert! After all, we are on vacation! Then, we waited in line for the Great Movie Ride, and enjoyed some scenes from our favorite movies come to life. A little Disney magic in front of Cinderella's castle. 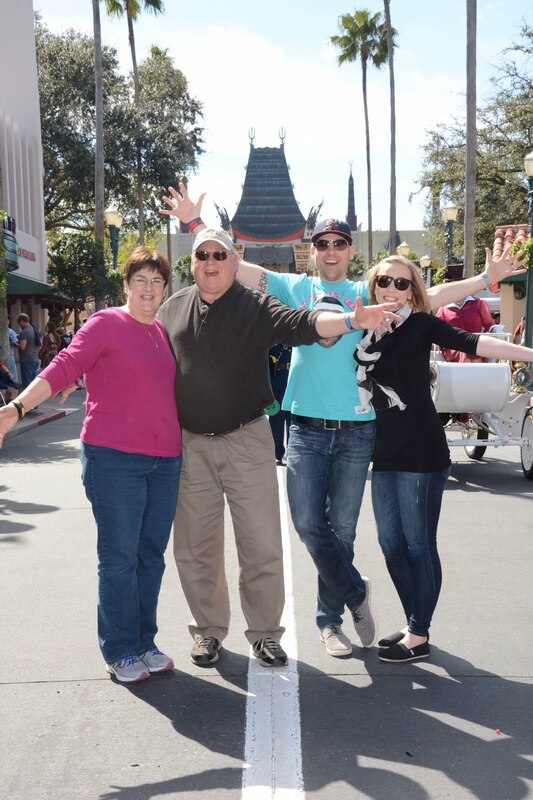 As a special treat today, one of my friends from my days at Mizzou, Kellee, and her family met us for a couple of hours at Hollywood Studios. We enjoyed some of the new Star Wars parts, and of course, stopped in to see the Muppets 3D show, which is always one of my favorites. Kyle is keeping an eye out for the Storm Troopers! Before long, it was time to head back to the hotel to get ready for dinner. 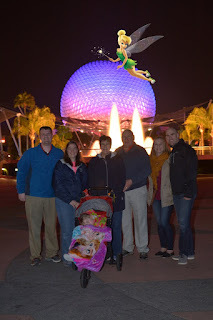 There was a bit of a mishap with the transportation, but we eventually made our way to Epcot Center for dinner at Teppen Edo in Japan. Our chef prepared our meal in front of us, and the food was delicious. It's been fun to be all together and share in the magic of Disney. 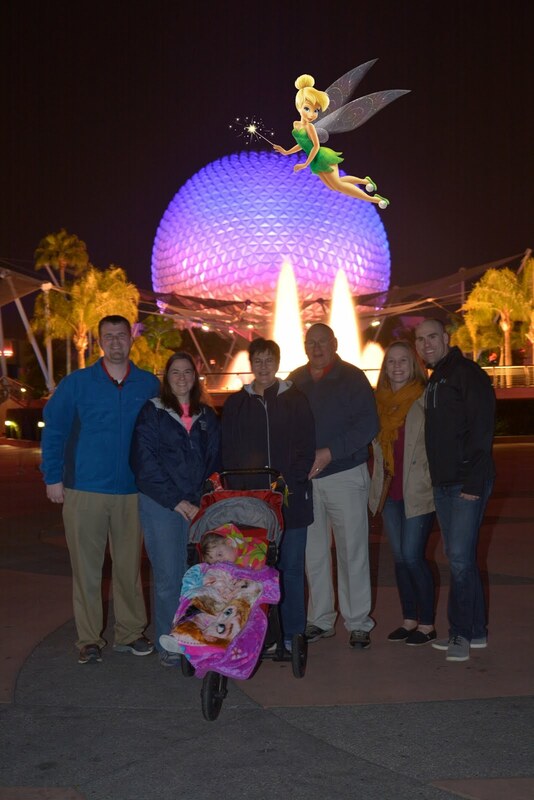 Family photo op at Epcot Center after dinner! It's hard to believe that tomorrow will be our last day in the parks. We can't wait to see what adventures may come our way! Our alarm clock went off this morning WAY before anyone in our household is accustomed to getting up. 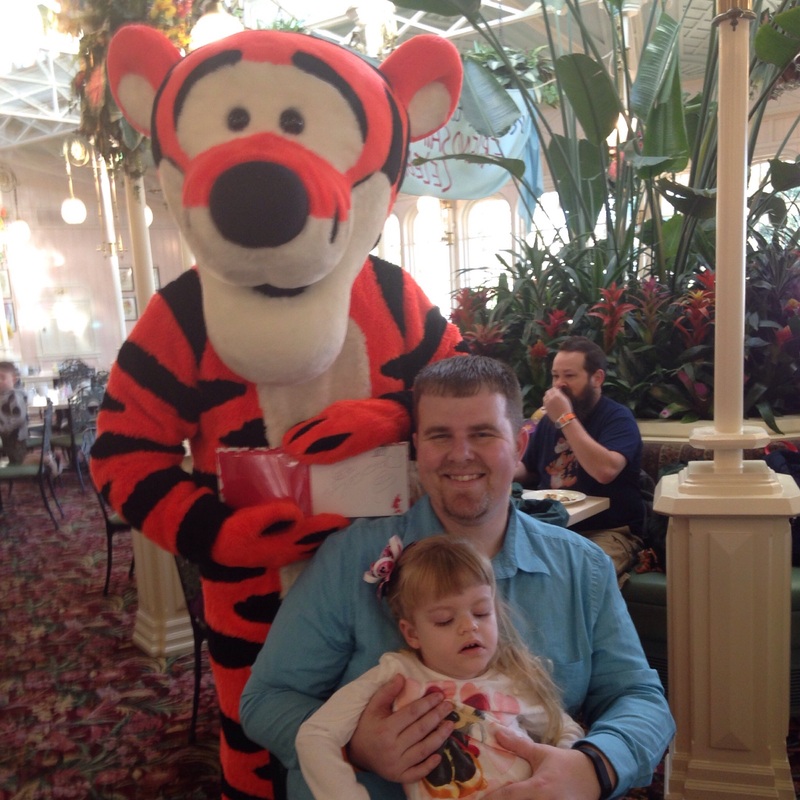 But we couldn't miss breakfast with our favorite friends from the 100 Acre Wood! 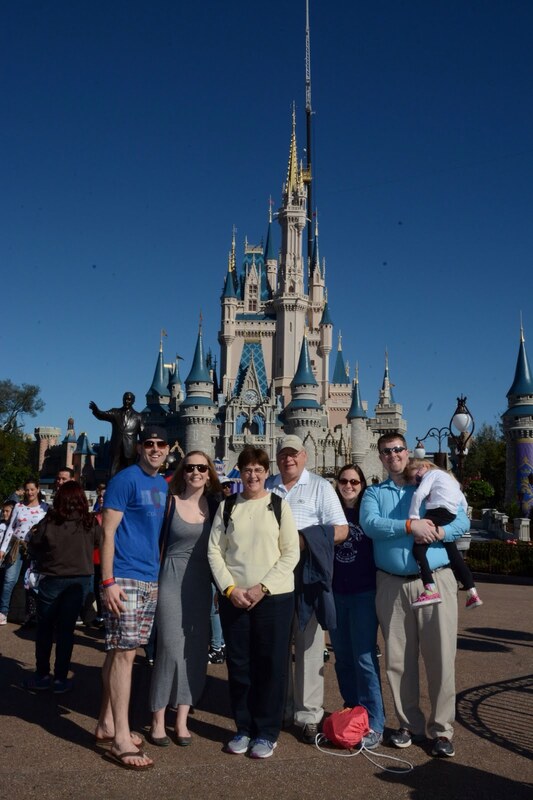 Family photo op in front of the castle! 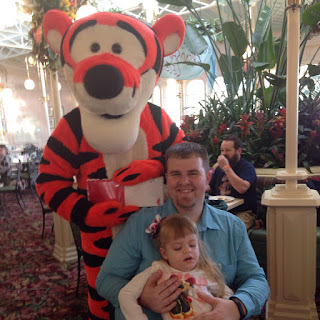 The last time we took Grace to Disney World, breakfast at the Crystal Palace with Winnie the Pooh, Piglet, Tigger and Eeyore was one of her favorite things we did. At only two, I was worried she would be scared of the characters, but after Piglet played peek-a-boo with her, she only cried when he left our table. Smiles for Winnie the Pooh! So, that was one of the first things we scheduled again this year. And it has something for everyone. The big people on the trip enjoyed a delicious breakfast buffet, while Grace got a chance to meet some of her favorite characters. Another bonus of scheduling an early breakfast is that afterward, the park is still filling up, so you have a chance to do some things without as much of a wait. 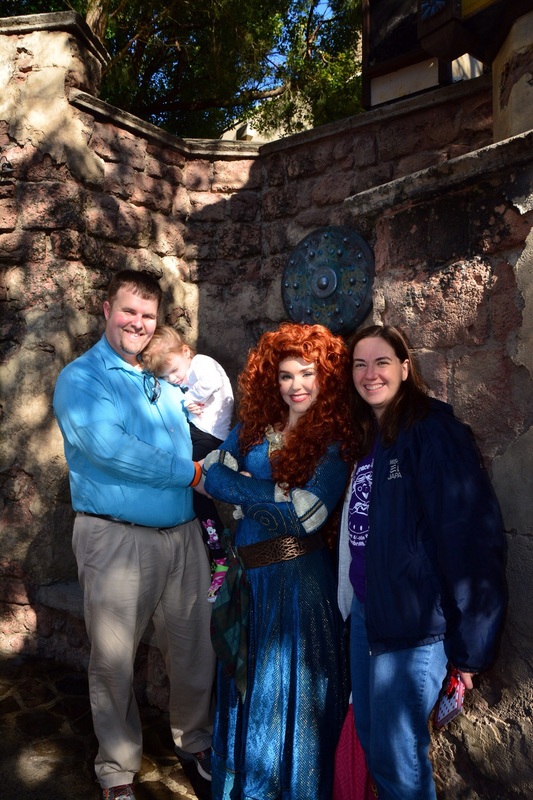 Our party of seven split up a bit, so some went to ride Space Mountain, and mom, Kyle, Grace and I went to meet Princess Merida from Brave. Although we've never actually seen the movie, Brave, we have a copy of the Little Golden book version, and it's one of our favorites. 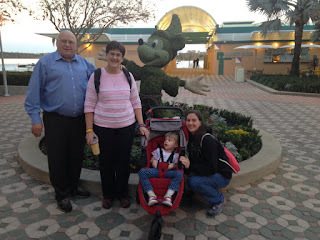 We also knew Grace would just enjoy meeting the characters this trip especially. She loves when anyone makes a fuss over her and tells her what a pretty princess she was - and nobody does that better than Disney. After meeting Merida and getting her autograph book signed, we met back up with our group and got a photo taken in front of Cinderella's castle. For Christmas this year, Johnny and Emily bought everyone the Photo Pass, and it's been great for getting pictures with everyone. With our first Fast Pass not scheduled until later, we split up again. Kyle, Grace and I headed for Adventureland, where Grace had the chance to meet up with Princess Jasmine. The rest of the crew enjoyed the Bear Country Jamboree. Then, we were ready for our first ride, one of Kyle's favorites, the Pirates of the Caribbean. It was fun to hear Grandpa John sing along to the song, and just enjoy the ride together. We even did a little looking in the pirate gift shop, just in case Kyle needed something new for his pirate collection. 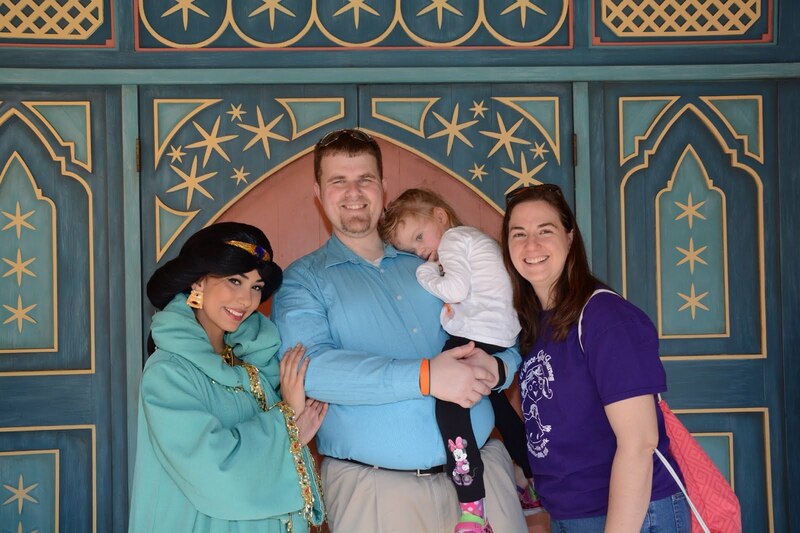 Getting to meet Princess Jasmine! We had about an hour until our next Fast Pass was scheduled, at one of Johnny's favorite rides, the Haunted Mansion, so we made our way to one of Grace's favorite rides from last time, It's a Small World. Since we had the sticker to use Grace's rental stroller as a wheelchair, we got quickly in through the wheelchair access. Sometimes it's hard not to feel guilty as we made our way to the front of the line, but then I remind myself, I would happily wait in line for hours if Grace didn't have INAD. And it's a way to help her out on the trip. It's a Small World has always been a favorite ride, with its bright colors and happy melody that you end up singing for the rest of the day. Kyle managed to take an awesome selfie of all of us together on the ride, just before Grace fell asleep. So, we decided it was time that Grandma Susie took her back to the room for some lunch and a nap. Grace loved hanging out with Uncle Johnny! The rest of us made our way to Big Thunder Mountain Railroad, and although Kyle isn't a huge fan of roller coasters, but he rode with us, and we all had a good time visiting in line during the wait. Then, we decided to grab a bite to eat, before splitting up again. Dad, Johnny and Emily wandered around and took photos in the park. Kyle and I wandered and did some shopping, and managed to make silly faces in the photo booth at the Space Mountain gift shop. On our way out of the park, we managed to catch part of the afternoon parade, and it was neat to see all the characters in their element. Grace was napping, but she will still have plenty of time to see her favorite characters in the days to come. As an extra special treat tonight, we had books Disney's Spirit of Aloha luau for everyone, and it was amazing. The food was fantastic, and served family style, you got to try a little bit of everything. My personal favorite was the pineapple bread pudding for dessert - and that was Grace's favorite too. And if the food was great, the show was phenomenal! It rained the night we were supposed to see the Starlit Hui show at Aulani in Hawaii, so this was an extra special time for us. And the highlight was the fire dancing at the end. It was just incredible. Kyle and I managed to stop by the gift shop in the Polynesian Resort before heading back to our room for the night. Time for a luau at the Polynesian Resort. As Kyle, Grace and I made our way back to the room, mom, dad, Johnny and Emily headed back to the Magic Kingdom for the spectacular fireworks show. We thought about going too, but it had been a long day for Grace, and we wanted to get her well rested for the next day. But the rest of the crew had Fast Passes for a special viewing area for the fireworks, but they were delayed for the evening. So, they rode Aladdin's Magic Carpet Ride, and enjoyed the lighted parade. It seems hard to believe that the first day has already come and gone. 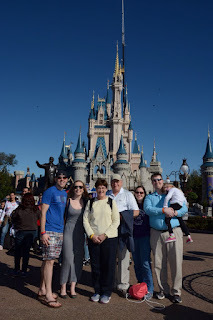 We had so much fun checking out the Magic Kingdom, and enjoying some of Disney's finest dining. But the best part, by far, is just the chance to be together in the Happiest Place on Earth. Today we embarked on another family adventure to the "Happiest Place on Earth." 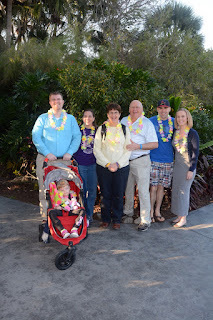 Two years ago, the three of us joined my parents, my brother and his wife on a trip to Walt Disney World in Orlando, FL, over the long Presidents' Day weekend. This year, we are lucky enough to go back! Our princess back at Walt Disney World. Mom and dad picked us up bright and early from our house and we grabbed some breakfast on the way to Lambert Airport in St. Louis. We were lucky and things went very smoothly as we got on board our flight. Major props to Southwest for letting us pre-board with Grace, and we got to sit in the very front row. Grace is an awesome traveler, and before we knew it we left behind two inches of snow and 21-degree weather for the sunny skies of Florida. Since we were staying at the Bay Lake Tower, which is on Disney property, we took the Magic Express to our hotel. Kyle and I had a friendly battle of Disney trivia on the hour-long bus ride, while Grace napped. Daddy and his princess with the Magic Kingdom castle from our hotel. We got all checked into our hotel, and picked up our stroller rental before finding a late lunch at the Contempo Cafe in the Contemporary Hotel. Grace and I split some spaghetti and shared a sugar cookie for dessert. We are on vacation after all! 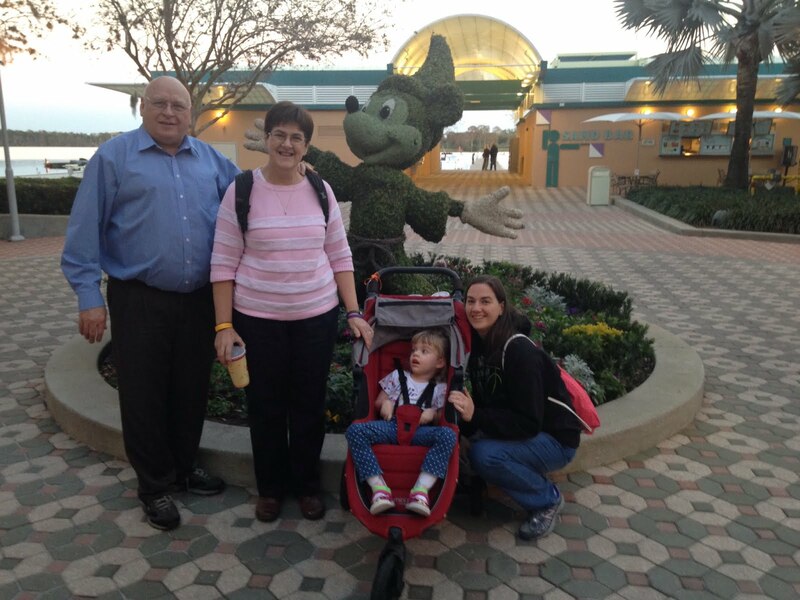 Just hanging out with Mickey Mouse and Grandma and Grandpa Galer. After dinner, Kyle, Grace and I stopped in at one of the gift shops and got Grace a very cute Minnie Mouse autograph book, just in time for our first character breakfast in the morning. Then we walked around the hotel, and took a few photos of some of the Mickey Mouse decor. While we were out and about, they were setting up for an outdoor movie of Tangled, but we were tired after our day of travel. This is Grace's Minnie Mouse shirt from cousin Dana. We had to wear it today! Not long after we returned to our room, Uncle Johnny and Aunt Emily arrived from their flight, and they set out to get a few groceries for the room and some dinner. We enjoyed the chance to visit together and are ready to head to the Magic Kingdom in the morning.